So far, we have laid down our foundation with the construction, and even started correcting some of the proportions and angles. We are now going to take an exciting step – we are going to flesh out the figure on top of that foundation. We won’t only do outlines, we want to get used to doing tonal shapes within the figure at the same time as the outlines – by which I basically mean the shapes of the shade. In this video, we’re going to explain the principles you can use for the outlines, and then after that explain the principles for the tonal shapes, but when drawing, you should be doing outlines and tonal shapes at the same time. Now, because we are taking a big step, we have a few focused exercises for each part, which we are going to go over in a follow-up video to this one. We are going to start to add outlines, but only allowing ourselves to use simple, mostly straight lines. We don’t need any details, we don’t need the little bumps and dips that the nuanced human shape has. Just continue each line until there is an important change in angle, at which point we need to change direction with a new line. The lines Mayko is using here are even too nuanced – you should go even simpler than this. If you aren’t sure of the angle to use, or the length the line should be, use the measurement techniques we went over a few lessons ago. This use of simplified lines isn’t something you need to keep doing, it’s a useful exercise for this stage. Keeping the lines straight will keep you focused on what’s important at this stage which is the bigger picture – the basic form. Straight lines will be easier to remove and replace, because less work went into making them. It’s also easier to get the next stage – proportions and positioning – right when using simple straight lines. Now regularly through this process, we can get help from negative space. Negative space is the area that the figure does not occupy. Imagine if the scene were a printed photograph and the figure was cut out of the photo with scissors. The negative space would be whatever is left. Do you remember that we talked about the mind’s preconceptions of the human body and how disruptive those preconceptions are? 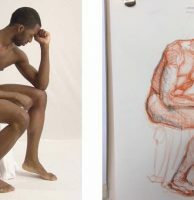 Well the mind has no preconceptions about the shapes of the negative space around the body, so lets observe those and check – does the size and shape of the negative space in your drawing look correct? At this stage, we aren’t only only going to roughly put in the outlines of the figure, but also the major shapes of dark and light. Often people want to do an outline and then fill it in, but it’s really difficult to get the outlines right without also adding the shapes of tone you see in the figure at the same time. 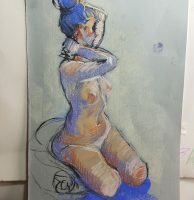 The shapes within the figure will help us get the outlines right and vice versa. The tones of a figure are likely to have very nuanced gradations, with shapes that have many little curves and undulations. But we want to cut through the detail. We are going to categorise everything quite crudely – into dark, mid-tone and light. And we will see these three levels as simplified shapes. So the the infinity of tonal gradations and nuance here, can be simplified into these 3 levels in simplified shapes. The real figure may not have very simple and clear dark and light areas in it. A figure that is well lit from multiple angles for example may not have very strongly contrasted shadows for example. But all we are looking for is relative dark and light. Even if the whole thing is quite light, there’ll always be areas that are a little lighter or darker. Lets find those distinctions. The construction that we laid down is going to be the foundation of this new set of contours, but if you notice it’s wrong, don’t stick to it. Use the incorrect parts as a reference to understand where things should be. In fact, don’t become attached to anything you have put down on the page. Most of it is going to change in the end. It is there to be replaced and moved around. For this lesson, it’s best to use a material that can be erased easily, like charcoal or pencil. If anything is out of place or wrong, you should feel nothing about just moving it or getting rid of it. It wasn’t a waste, that incorrect line is how we learned where the correct line would be. I know that Mayko’s demonstrations make it look easier than it is – if you are struggling, or your drawings don’t like right, that is perfectly normal. 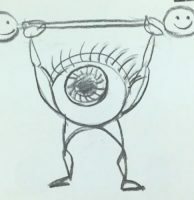 There’s so much that comes through pure quantity of practice, strength in your eye’s observations and arm’s muscle memory that take thousands of hours of practice, so even if you’ve understood the lessons well and started to do the exercises diligently, you’ll still need some patience and perseverance to see results. Make sure you continue to do the exercises we have gone over so far – the movement lines, the ribcage shape, the superstickman, the measurements and angles – these aren’t exercises that you do once and then you’ve got it. You need to keep doing these things. We wanted to give a proper explanation of the two exercises for this lesson, so they have a separate article and video you can find here. So we actually have a lot of exercises for this stage, so we have a separate video on them. 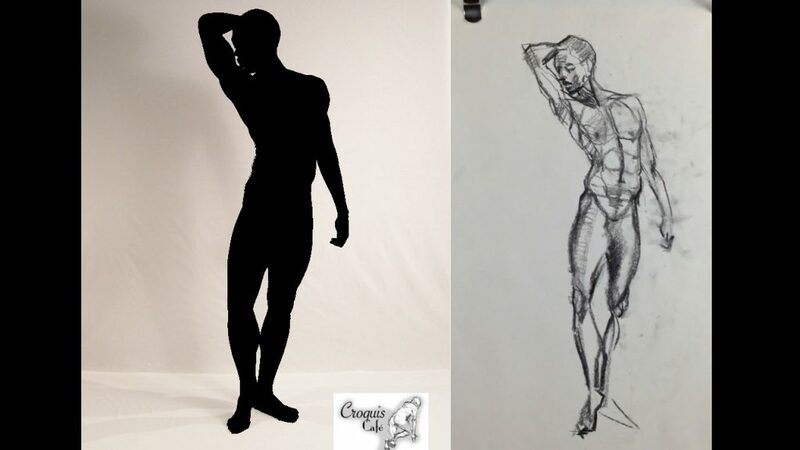 We have arrived at an exciting stage in our drawing process – we are fleshing out the figure so it actually looks like a person. In the next video, we will go over exercises to help practise what we went through in this lesson. After that, we are going to review the whole drawing process we have learned about in this series.